In 1990 I visited a friend in Lame Deer, Montana, whose father-in-law was suffering from a broken neck, so he wore a “halo,” that contraption that looks like a steel cage with his head screwed into the middle, all of it resting on his shoulders. The old man was a grouchy WWII vet who complained of having suffered wounds, boasted of having earned medals. Huh, I thought. My uncle got the only medal that’s important. I thought of my uncle Carl, killed aboard the SS Leopoldville, Christmas Eve, 1944, and so on and so forth. I’ve told about this so many times. He didn’t get a lot of medals, just the purple heart. I once saw that medal in among my grandmother’s things in Kalispell. She kept all that stuff in a drawer in a desk in the parlor, or living room. Parlors used to be the place in one’s home where you put dead people before burial. Hence, “funeral parlor.” About the time when bungalows came into style, the front rooms no longer became the places for the dead, but “living rooms.” You probably knew that. The friend’s name with the ailing father-in-law was Jim Bishoff. He is a physician, or was, before he lost his license. He was accused of murdering Sarah Anthony’s friend’s mother by administering a lethal dose of meperidine at his clinic. To pay for a lawyer, he robbed a bank at gunpoint and is now serving a prison sentence in Deer Lodge at the Montana state penitentiary. That’s how that came out. Bischoff’s wife died in a car wreck around the time of the robbery. Her dad, the one who had the broken neck in Lame Deer, presumably died of something else, by this time. What gets me about my grandparents’ photo in 1957 is how old they look. 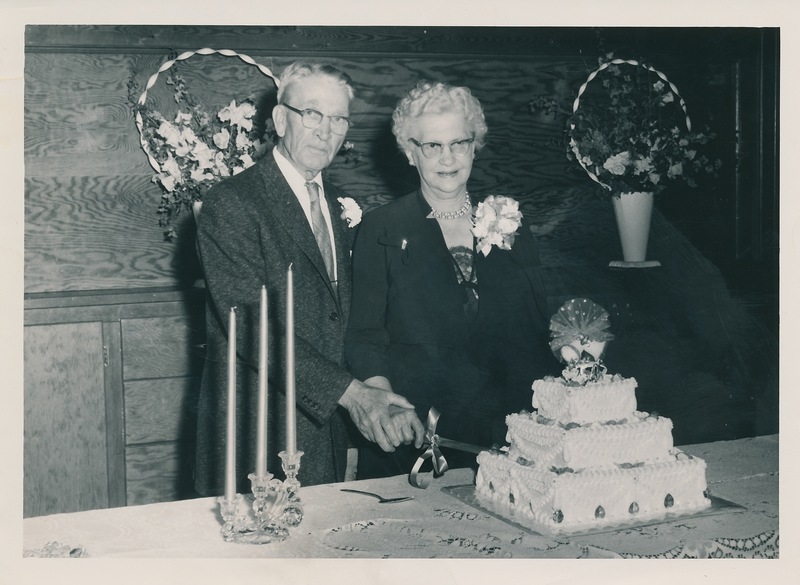 I have other photos from the big 50th wedding anniversary in Kalispell. Relatives from far away came, including some very pretty girls that I was thrilled to sit next to, although I had to pretend that I didn’t like them because I was in the 6th grade. I think they were second cousins. I still have those photos somewhere.